I liked the image of Amaterasu leaping towards something, so I traced that. Then I needed for her to be leaping at something, so I found a neat scan of a warrior (Akakabuto), and traced that. Since the Akakabuto had the kanji for fire on its helmet I then found a third scan with some smoky spiraling fire and traced that. Amaterasu and the Akakabuto were repainted in Painter, and then the whole wallpaper was composited in Photoshop. Similar to my previous Okami wallpaper, I used the same parchment texture and faded out the colors to give it an aged old-scroll effect. Browse Okami Gallery: Recent | Popular. There aren't a lot of Okami walls, and this one is rather nice. :) I like the parchment texture, it really suits the image. Finally get to comment on this. The vectoring is awesome and I love that scratchy feel! Really neat effect. Gee, this is impressive! I'm just stunned! 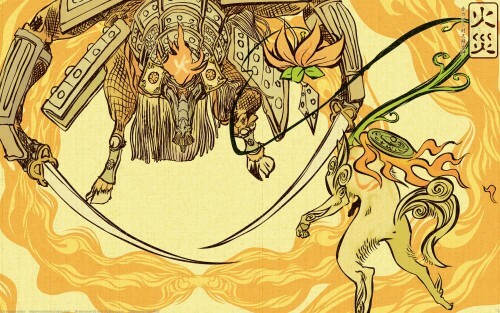 I really like Okami artwork! Congrats for the good job! Wow.. just wow! This is so great thanks for sharing this!